Do sanctions threaten Iran’s pro-democracy movement? The crushing international sanctions being imposed on Iran over its controversial nuclear plan have caused tremendous economic pressures on ordinary people. Analysts from across the political spectrum agree that the skyrocketing price of goods, dramatic decline in currency, increasing rate of inflation and lack of medicine (particularly for patients suffering from rare diseases) are among the many devastating impacts that the sanctions are having on Iranian citizens rather than the state. However, there is less consensus among activists regarding the impacts of sanctions on political and social movements in Iran, and particularly on the Green Movement, which formed in 2009 in protest against the outcome of the controversial presidential election. 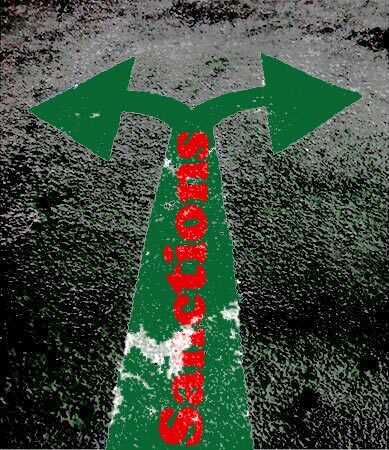 Iranian activists find that sanctions have had both positive and negative impacts on the political situation in their country. Some claim that the economic effects on the middle class are so extreme that this key part of society is losing ground. They opine that the middle class, which is the base of the Green Movement, is abandoning its political aspirations and is now making only economic demands. Rejecting speculation that sanctions might fuel public discontent over harsh economic conditions, Faryabi argues that Iran’s political history has never seen successful “bread riots” that ended in democracy. At the same time, other Iranians refer to South Africa as an example of a successful transition to democracy brought about by the force of economic sanctions. Activists in this camp deny that the sanctions against Iran have had much to do with the decline of Iran’s pro-democracy movement. Since the 2011 arrest of Mousavi and Karroubi, the Council of Coordination of the Green Path of Hope has become the movement’s most important decision-making authority. In addition to the Council, many activists look to distinguished figures of dissident parties within Iran, usually referred to as “reformists,” to help organize their activities. However, their ability to organize and lead the movement has come under criticism. Though the movement appears silent, in their open letters from behind the bars, political prisoners insist that it is still alive. However, without support from the Iranian diaspora, the movement is unlikely to be reactivated due to the harsh economic situation, political repression and internal strategic flaws of the movement. The opposition abroad can assist the movement inside the country by being a voice for the society in the media and putting pressure on global powers to acknowledge the serious human consequences of economic sanctions. Ali Tehrani is an Iranian journalist and a nonviolence trainer. Behnam Saremi is a freelance journalist and a political activist from Iran. He is a former political desk editor of the "Iran Daily", a Tehran-based English-language newspaper. If the shoe were on the other foot, just imagine what the US government’s response would be if the world sanctioned the US for its militaristic imperialism. If only the US would use real foreign relations policy instead of real military policy. Extending the olive branch instead of brandishing the sword and taking away the bread would make a world of difference. Gary, your point about sanctions on the US is an important one, but I’m not sure it helps us figure out the conundrum of sanctions in the case of Iran. What I appreciate about the article is that it grapples with the complexities of when and whether international sanctions help or hinder the prospects of nonviolent opposition movements faced with repressive regimes. I think that one element that helped in the South African case was that the sanctions were explicitly being called for by anti-apartheid activists almost across the political spectrum (there were some moderate critics of apartheid who opposed them (didn’t Helen Suzman oppose them, for example? ), but they were in a distinct minority). Plus, the sanctions were explicitly in response to the human rights violations of the apartheid regime. In Iran, how does the fact that the sanctions are directed at opposing the development of nuclear weapons capability affect the opposition? It would be interesting to hear from more of the opposition (understanding that they are brave to be speaking up in opposition in the first place and might be constrained for safety reasons from speaking out) on this score. Ready for Hillary? How about a mass populist party instead?